A Tale Told By an Idiot? Take Larry Walters as an example. 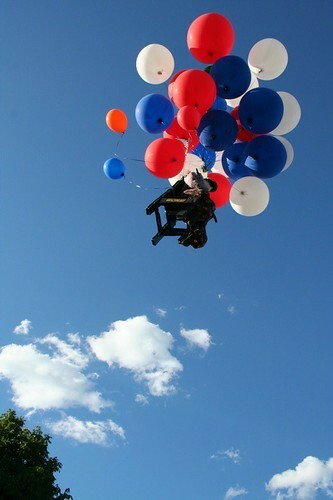 Larry made history in 1982 when he fastened 42 surplus weather balloons to a lawn chair and launched himself skyward. He carried a CB radio and a BB gun to shoot the balloons when it was time to descend. It may be a surprise, but Larry didn’t think this plan through very well. He reached altitudes of 16,000 feet before he started to descend, and was spotted by pilots from both TWA and Delta Airlines. After getting the ride of his life, Larry landed in a residential neighborhood in Long Beach, got tangled in power lines, and caused a power blackout. Unfortunately for Larry, this literally was the ride of his life. Several years later, he decided Macbeth was right, and Larry shot himself to death. He had enough of the thrills and adventure, and there was nothing else except the sound and fury that meant nothing. We have been called according to God’s purpose. We were made in his image and are called to be conformed to the likeness of his Son. We are to live in relationship to him and are to live like him. What a high and holy purpose that is—that signifies a lot. May we not get so busy with the details of life today that we forget that we have been given a purpose for today and everyday!